My grand plan to write a daily diary from Jerusalem on the Christ Church blog didn’t quite work out: there was simply too much to see and do at the conference. So with many apologies, this is an attempt to sum up a remarkable week. If I was to sum up Gafcon in one word, it would be “joy”. There were very serious matters that called for our attention: notably the betrayal of Christ by the western churches, and the persecution of Christians around the world. But none of that detracted from the sheer joy of Gafcon. The joy of worshipping Christ in Western hymns and African songs, (I have now had Hakuna mungu kama wewe running through my head for two weeks without stopping). The joy of praying in the same small group every day, with brothers and sisters from France, Uganda, Nigeria, and Chile, forming lasting friendships in the process. The joy of worshipping with nearly 2000 others on the steps of the temple where Jesus walked, and where Peter preached at the first Pentecost, with people spontaneously bursting into Amazing Grace and Tukundereza Yesu. The joy of sharing in the final communion service; I don’t think that I was the only one who wept. An especial joy to me was to see brothers from Africa taking the lead. I knew that the centre of gravity of Christianity was shifting to Africa in terms of numbers; but I had never realized before how much the apostolic leadership of the church has now shifted to Africa. That joy I think came from the theme of the conference which became a repeated battle cry: “We will proclaim Christ faithfully to the nations!”. Gafcon 2018’s focus was the Good News of our Lord Jesus. This was the symbolic importance in coming to Israel, where Jesus lived, died, and rose: we were coming back to the roots of the faith in the person and work of Christ. Each morning began with a Bible exposition from Luke’s account of Jesus’ death and resurrection (with preachers from Uganda, England, Chile, Australia and Singapore). That Gospel-centeredness was very clear in the opening plenary session, where Archbishop Nicholas Okoh of Nigeria, the chairman of the Gafcon primates’ council spoke from Romans 1 on “God’s Gospel”. If you watch one video from the conference, this would be the one to see: go to vimeo.com/275652925, and the talk begins at 4 hours, 50 minutes. 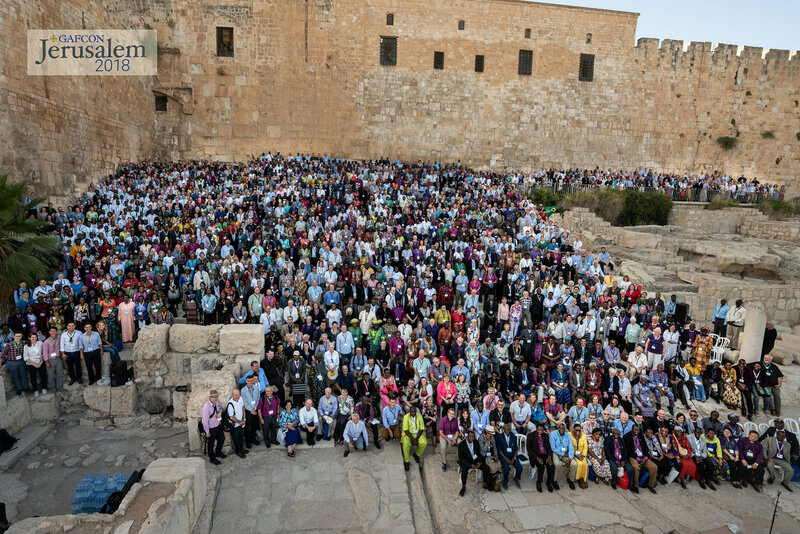 Gafcon was a working conference, and we had some serious labour to do. Regional groups met in closed meetings, which went on late into the evening, to consider how we could work together to proclaim Christ faithfully to the nations. Most importantly, we produced the conference statement, a “Letter to the Churches”. I say “we” deliberately: a first draft was read in a closed session of the conference, and we then discussed it in regional groups. When the final version of the statement was read to the whole conference by Archbishop Laurent Mbanda of Rwanda, it was clear that the drafting committee had listened to the regional groups, and that the vast majority could heartily approve of the letter. It was welcomed with a standing ovation. This letter is extremely important, and I would urge everyone to either read it or watch the video of it being read out at vimeo.com/276511037. One very important thing to note in this letter is the insistence that Gafcon is not leaving the Anglican Communion; rather, it is the majority of the Anglican Communion. The divisions within the communion have not been caused by Gafcon, but by the liberal churches in North America and Europe, who have deliberately disobeyed scripture notably, but not solely, in the area of human sexuality. There is a clear consensus within Gafcon that the structure of the Anglican Communion, which are supposed to keep it together under Christ, have failed in their task. Therefore it was encouraging to see the growth of new structures from within Gafcon, notably a synodical council and seven networks looking at different areas of ministry. In Europe, there is the Anglican Mission in England (AMiE), for Anglican churches that are outside the structures of the Church of England (www.anglicanmissioninengland.org/). Gafcon is a human movement, composed of sinners; and like all such movements it has its flaws and weaknesses. It is a broad coalition of different groups, and within it there are some deeply held differences of opinion; for instance over whether or not women should be ordained, and around the charismatic movement. These have the potential to divide it, and we need to pray for a true unity based on Christ-like humility and obedience to the word of God. Whilst it was very sad that no diocesan bishops from the Church of England were there, it was encouraging to see the quality of godly leadership. Bishop Andy Lines of AMiE, who preached here at Christ Church before his consecration last year, was announced as the Gafcon coordinator for Europe. Then on the last day it was announced that Archbishops Nicholas Okoh and Peter Jensen would be retiring as the chair and General Secretary of Gafcon. Their places will be taken by Archbishops Foley Beach and Ben Kwashi, of the Anglican Church in North America and the Church of Nigeria respectively. These are wise and godly men, who have both paid a price for their faithfulness to the Gospel. We will proclaim Christ faithfully to the nations.